"...Featured in various television shows, including Private Practice, Pretty Little Liars, Switched at Birth, Vampire Diaries, One Tree Hill, 90210, Home and Away, and Rookie Blue, as well as on such films as Brooklyn Brothers Beat the Best, Craigslist Joe, Never and others. In addition, Costello is a contributing songwriter on many other artists’ projects. Her music has also been featured in such prominent publications as Vogue, Teen Vogue, Marie Claire, BlackBook, Paste and Billboard..."
"The album features 11 tracks of riveting and uplifting alt/pop that sees Costello at the top of her game." "Costello’s new album is sure to win you over. If you’re looking for an album with an eccentric sound, Twice the Love is what you’re looking for. Costello’s voice is the perfect fit for the pop melodies and rhythms she uses throughout the album. Each song contains compassion, hope and a sound that will keep you hanging on for more." "The pop artist celebrates fun, positivity, and coming together in the city that never sleeps in her latest music video..."
"We were lucky enough to hear this album in full before it was released, and we can guarantee it’s a total must-listen on repeat sort of album." Katie Costello talks to The Vinyl District about her love for records for their First Date series. "A fantastic pop record delivered by a stunning voice that harmonizes throughout with some incredible sounds, from slower moments on tracks such as Lights to the energetic tracks such as New York Graffiti, it’s certainly an album that I’m going to listen to a lot more of. Costello continues to be so impressive on this record." "From writing songs as a way of therapy to making her first album at the young age of seventeen, this next artist is one to look out for. 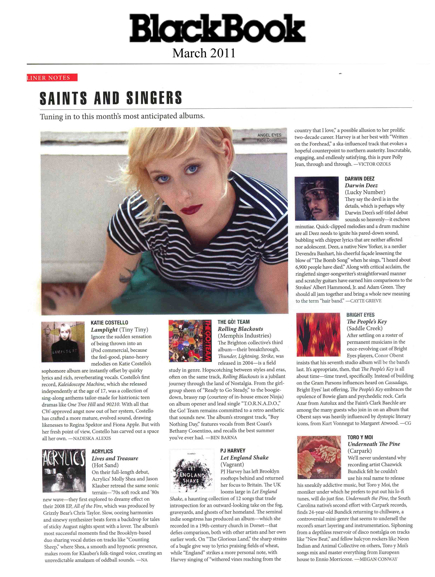 Katie Costello creates 'rebel-pop anthems' for everyone and anyone who needs it." Popstar! Magazine Peremieres New Video "Hearts on Fire"
"Katie Costello sets Hearts On Fire with her music and honestly, we are here for it. Rebel Pop Records artist and co-founder Katie Costello has a new and fresh vision for modern pop music. With her anthemic slabs of pop positivity, tracks like 'New World' burst at the seams with the kind of upbeat open-mindedness that a world currently in turmoil needs." "In advance of an October full length, Brooklyn-based Katie Costello dropped the New World EP earlier this summer, a thoroughly charming mix of toe-tappin’ anthems and present day anxieties. The title track and opener hits the latter the hardest, Costello and friends in search of better days amongst increased fear and anger. And in the Tracklisted tradition, check out what inspired Costello in the recording of New World." 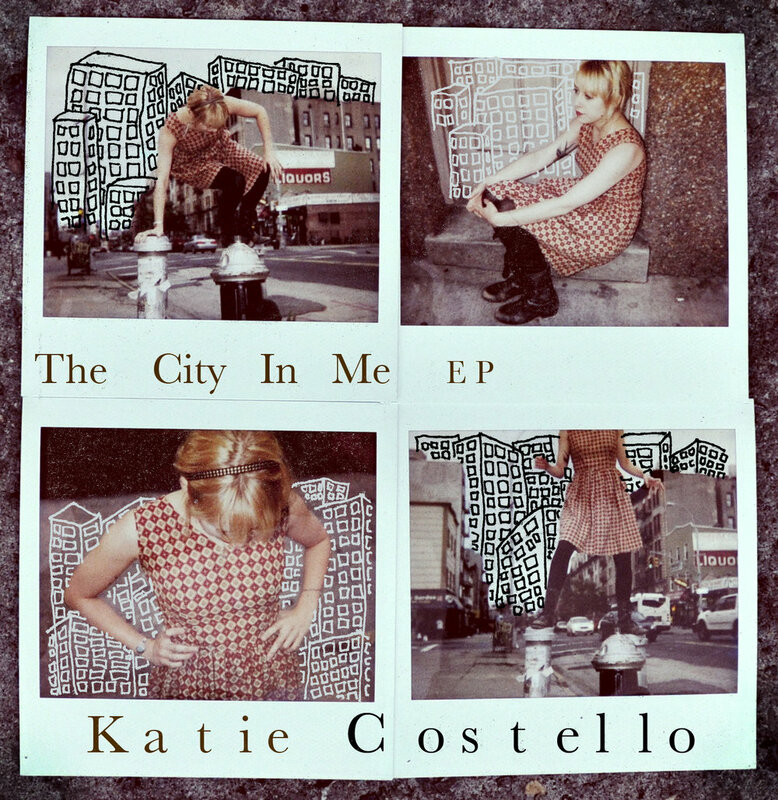 "Katie Costello has an otherworldly vibe about her. Her voice has been compared to Ingrid Michaelson and Regina Spektor. She has such a unique vision and way of looking at music and her new EP 'New World' is unique and interesting." "Katie Costello. A Californian queen with an upbeat pop star message to share into the dismal heartbreak of modern life. Costello has been writing since she was just thirteen years old, injecting hope, happiness and diversity into every track she produces." 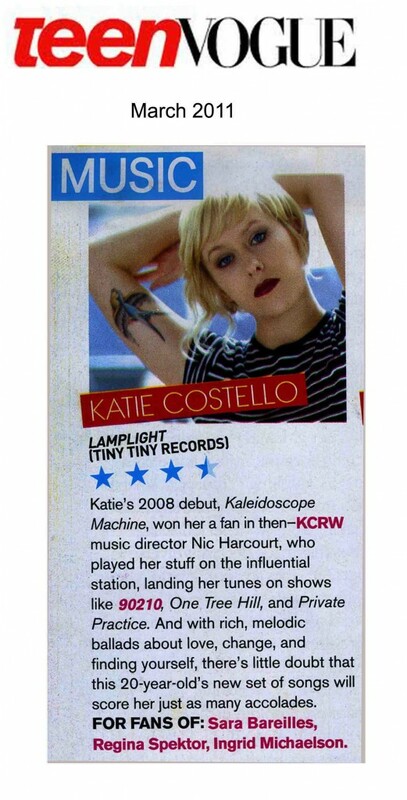 Trendsetters Magazine Review of "New World"
"Brooklyn-based pop artist Katie Costello has taken the music world by storm with the release of her new EP, New World... The EP is full of what could be called pop positivity. The title track offers positive lyrics that bring forth a whole lot of truth. Put it together with the upbeat tune and Costello’s soothing vocals and you’ve got the perfect mix! New World serves for the perfect motivational anthem to get you on your feet and making a difference, just as Costello exclaims through the song." "A trio of delights, New World is a great EP from Costello who can make melody and can craft a chorus like no one else. I am not going to pick a favourite as all three tracks are made perfectly, the three work together, these songs are just right, go listen to them as soon as you can." Katie Costello’s EP New World is a most impressive pop record. While most top 40 songstresses sing about romantic relationships, crushes, and breakups, Costello turns her attention to real world matters and it is akin to drinking a refreshing glass of lemonade on a sweltering hot day. It’s just what you need and it feels good. With the state of the world today, we need to stand together to make changes, and we need music that remind us we can get through this. Katie Costello’s “New World” is just the song we need, and the video drives home an important message. Singing positive pop-anthems is what Katie Costello enjoys about writing and playing music. Her premiere single with AXS, "New World" is a testament to that positivity. Her music is already well-loved by fans and industry tastemakers, including hit reviews from Interview Magazine, Paste, and many others. The NU - KATIE COSTELLO IS A "BEAUTIFUL MYSTERY"
Katie Costello brings to life the inner rebel that we all have inside of us. She was born and raised in Southern California and quickly felt the suffocation of the “mundane” produced by living in suburbia. Ergo - in tune with her “rebel pop singer songwriter persona” - Costello moved to New York to pursue her dreams of a possibly flourishing and enlightened musical career at only the age of 17! ... Her music is a breath of fresh air and she is utterly true to herself in her lyrics. “Live young and free… This world can be a beautiful mystery,” reminds us all that life is fleeting and our curiosity should meet no bounds. -Isanna Biglands, The Nu - Katie Costello Is A "Beautiful Mystery"
More prescient then ever! ...Great song and vid! -Rosario Dawson, on Katie Costello's anthem "New World"
Filter Magazine - Video Premiere "I Will Surrender"
"A couple years ago, when FILTER tracked down the whereabouts of quirky singer/songwriter, Katie Costello, she was on the verge of dropping her EP, The City In Me. After releasing a full-length in 2011, and then another EP back in May— Follow Your Every Beat (Tiny Tiny Records)—the blue-eyed blondie is popping out yet another EP." -FILTER Magazine - Video Premiere "I Will Surrender"
"Los Angeles native Katie Costello stands as a beacon of musical brilliance amidst a faltering and generally mediocre Pop music environment. It would be simple to compare her to someone that is well-known in hopes of trying to gear one's attention that might be acclimated toward a specific type of genre, or group, but that would be a massive disservice to Katie's quirky sensibilities and insanely talented songwriting abilities." -Alex Mendoza, Skinnie Magazine Music Feature: "Old Soul, Bright Future"
Campus Circle - Review Of "Lamplight"
"She is dedicated to creating quality music... Songwriting is her therapy, and Lamplight is an album that communicates her very private emotions about loneliness in a strange city, her attempts at finding herself and her struggle with feeling inadequate." 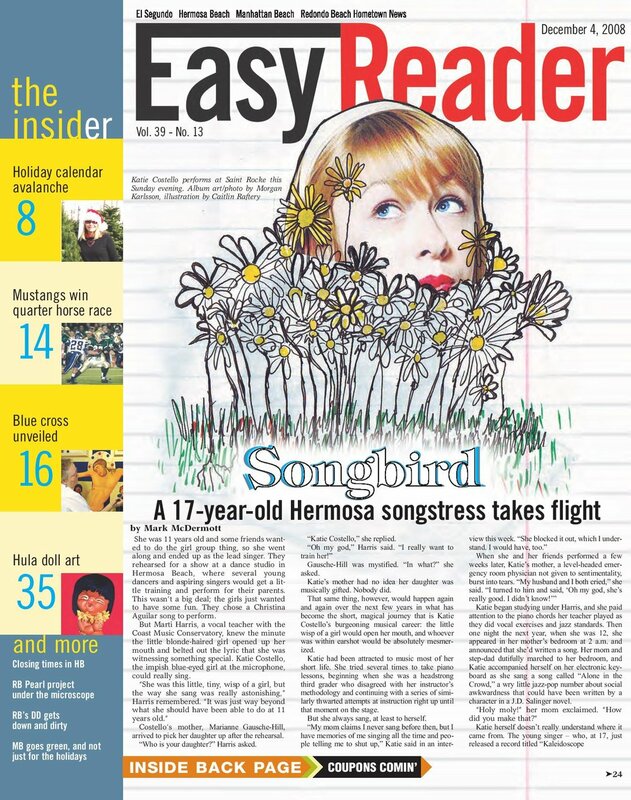 -Campus Circle Review of "Lamplight"
CMJ - Music Feature "The Only Living Girl In New York"
"Costello’s music, while pop-y and upbeat at times, possesses the soul of quirky indie and the instrumentation of rock. Her second album, Lamplight, is full of songs of a similarly genre-defying nature." -Keyana Stevens, CMJ Music Feature "The Only Living Girl In New York"
Sennheiser - Katie Costello Winner of "My Song Contest"
Microphone manufacturer Sennheiser has named 18-year-old Katie Costello as the grand-prize winner of its first “My Song Contest,” which was created to recognize the songwriting talents of high-school students across the nation. "Costello is already armed with an incredible amount of talent and star power, which will surely pay off as she makes her way into the music industry." -Sennheiser Announces Winners Of "My Song Contest"